Hi Elaine, thank you for reading my posts that expose my dark side, as well as the ones that expose the fun in me. I always love reading your comments, they’re always filled with joy. Aaaah. Elaine. Thank you. I’m sure you know I feel the same way about your beautiful artwork, which I continue to enjoy and love to watch your creative process. Looking forward to your book Cathi. Am eager to find out how you could have connected all those wonderful blog posts into one story. Aaaah, thank you so very, very much. When the book comes out (sometime in April, I hope) I’ll post about it on my blog. Keep riding but take precautions and avoid unnecessary risks. Smart words from a smart, talented lady. Thank you, she says, puffing out chest (and blushing). So nice to know you’re another anxious person. It’s always great to meet another member of the club. 🙂 What’s a fish-balloon? It’s what I saw when I looked at your deflated friend …. Continue to enjoy the beautiful ride, Cathi. You owe it to yourself! As long as I wear a crash helmet at all times. LOL. Seriously, I really appreciate your very kind and thoughtful words. Agreed. My new therapist asked me if I am a worrier. I said yes, it is my Default Mode. Ha ha ha haaaaaaaaaaaaaaaaa!!!! Mine too! And it’s an art form–we get better at it as we age. Great wisdom in your comment. Lots of food for thought. Enjoy the journey! None of us gets out of this alive! I can’t wait to read your book as well. Solid point Angela–no one gets out of this alive. So why not calm down and be part of what we’re privileged to experience? It makes sense in my head–it’s just harder to translate to my heart when I’m feeling anxious. An onging journey for me. Also–thank you for your kind thoughts about looking forward to my book. I’ll keep you updated on this blog. I was thinking of all the people that balloon would have brought a smile to. Little kids sitting in their car seats and driving by , people looking for a new house, kids in the nearby play areas ….. As the balloon would have soared higher, the more people who would have looked at it and momentarily forgotten what they were going through.. You have lived a wonderful life, balloon! Oh my! What a beautiful, beautiful thought! You just broadened my perspective on the balloon’s experiences (and my own life experiences as well) in such an enchanting way. Thank you! Balloons and butterflies have always brought a smile on my face. Had never thought of what a withered out balloon would feel like. I just assumed that they would never have any regrets. I should have known, Cathi. I saw your site name when you liked a comment I’d made on Molly’s site. Those two things alone should have given me a clue that you share Molly’s wonderful sense of humour and fun. I write about the same concepts, but only wish that I shared in your and Molly’s imaginative and wonderfully descriptive style. I’ll follow and look forward to reading back through your archives just as soon as I have a chance. HI Karen, so nice to meet you! Since you write about the same concepts as Molly and me, I’m sure I’ll love your blog as well. Looking forward to following you. 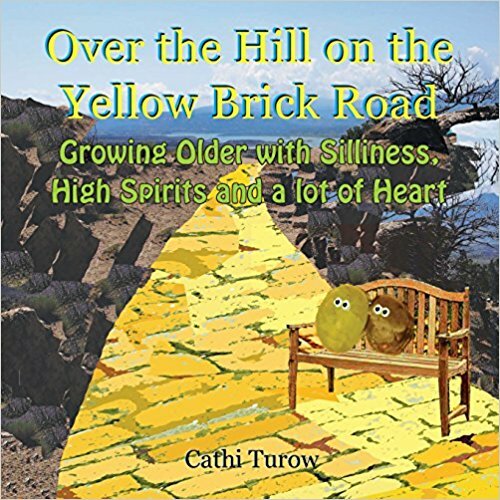 There is a fine line between comedy and tragedy, Cathi, and I don’t think you should hesitate to publish even the things that are intense. This is a fact of our stage of life, and I envision it becoming even more of a concern as we age. I feel lucky right now to now be losing many of my peers but in another decade, it will likely be a different story. The two choices at the end are relatable. Do you live in the moment or worry so much about the future that you miss out on the present? I try to live in the moment, but sometimes it’s easier said than done. Oops. I made a little error. I responded to your first comment (about the tea kettle) thinking you were responding to this post. The most amazing thing is, I wrote “easier said than done,” and here, you wrote the exact same phrase. I guess great minds think alike. LOL Living in the moment is the smartest choice, and hopefully we can shove all the overshadowing thoughts out of our minds so we can be in the present. Thank you so much for your honesty. Sometimes when I worry about losing friends and family, etc., I think I’m obsessing with this phase of life. On the other hand, we really are facing some difficult things and it requires bravery to look at them. I really appreciate your understanding. Well said….let’s enjoy the ride for as long as we can! I do think that we have to be intentional about this, though. Because when we reach a certain age, then we have to realize that we are indeed in the final phase of our life. And it’s easy to be afraid of that and to obsess about it. But all we can do is just keep on living life as fully as we can. I feel the same way. I wish I didn’t struggle with it at times, but it’s comforting to write about it and receive feedback like yours. As always, thank you for your most thoughtful words. Fabulous way to portray our worries and fears. It’s never easy. But always great when I can pull it together. I love your perspective! It’s empowering to me, too. We definitely should just enjoy the ride! having said that, I do have to admit that those fears also run in my family 😉 But I try not to be obsessed about it. Wonderful conversation, Cathi! Thanks so much. As artistic souls (and I know you’re one of them), maybe we have to go to these “darker” places sometimes to find new light. I just love your writing. You are so right about it. You have such a unique way of making the point that all of us feel. Wow. You just touched my heart with your comment. Your words and virtual friendship mean so much to me. Have a beautiful 1st day of May. Some of your followers should meet my mom, maybe form a club or something like Worriers Anonymous. I was one of you for a very long time but have given it up for retirement. I generally kept my worries to myself. I don’t mind so much that Mom still worries, I just wish she wouldn’t share her worries, especially about my adult kids (who are forever and always her only “jewels’), with me. At least she has finally learned not to share those worries with them! I’ll share with you and anyone else who may see this a quote a got from one of those “saying per day” calendars. I think it’s overarching subject was “Murphy’s Laws” or something like that. I first came across it probably thirty or so years ago, and shared it especially with my late dad, who also kept his worries to himself. “Worrying about something that may never happen is like paying interest on a debt you may never owe.” Maybe this will help you sometime? Thanks so much for your honest comment. I think the worrying issue sometimes stems from the way a person has been wired all his/her life. In my case, I’ve always been a professional worrier so it’s hard to stop. But! I’m hoping at this phase of my life I can be more mindful of it and turn it off. You’re right, it doesn’t pay to worry about things that might not ever happen and that we certainly can’t control. Thanks for sharing your heartfelt and helpful thoughts.